Yay, an excuse to draw a scantily clad anime girl! edit: that jaw line badly needs some AA! With every specular highlight added, the importance of that highlight diminishes. I feel like we've lost sight of what's actually going on under the shiny bikinis and overexposed hair. I took some liberties with the hair, just because that's how I usually do it, and couldn't stop myself in time to work more within what I think you were going for. Still, all it involves is finding a flow. I'd start with defining what direction each clump of hair is going, then find the place where they all start. Just work out from the convergence point, making sure all of the hair is flowing well, and you've got a nice head of hair. How you shade and highlight it really depends on the style and setting. I wouldn't define any muscle with an outline, unless you're drawing a bodybuilder. Especially on a woman. Make sure that you're compensating for the entire head under the hair. Most of the time it's a great idea to draw the entire bald head before working on the hair. I figure a bikini babe wouldn't be quite so pale. I rendered it a lot more realistically than I think you were going for, but it's always good to remember what it would look like if it was rendered with a more naturalist approach. Her nose and mouth seemed a little bit wonky. She didn't really have much of a chin, and her nose seemed uber long. Not too noticeable, but it's a good idea to mirror your work as you're going along to make sure nothing is skewed. I took all of your edits into consideration, especially on the hair because I loved the different array of colors used, I was going to do some AA on the chin, but then i realized, Idk how to AA very well, so I'm going to practice that. Kcilc, I loved your edit a lot too, the hair looks very natural and puffy. BUt I wasn't really going for a realistic look since this is anime, but I will save yours for reference because I loved it. The new hair looks like a metal sculpture. Regardless of style, I strongly encourage you to study Kcilc's edit further and see how he convey's depth and volume. I also suggest you take another look at PixelPiledriver's use of hue shifting and try out that technique yourself. 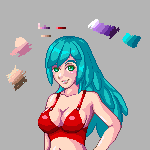 So I fixed a few proportional issues, changed the hair color a bit, and changed a few skin tones a bit. Getting there. Now I suggest working on depth -- the current shading flattens out the shape of the back of the hair.